Having a genuinely sunny disposition isn't my default mode. For much of my adult life, I have had an overly analytic bent and a tendency to consider worst-case scenarios, which may have engendered thoughtfulness and responsibility but not lively exuberance. I have had to learn and practice optimism, lightheartedness, and, well, cheerfulness. As a result, I have gotten better at being positive and enjoying curves in the road. There are several techniques that have benefited me (and my friends) when circumstances or mindsets threaten inner contentment and outward joyfulness. Talking to a trusted friend about your troubles can be therapeutic. A friend can often give you better perspective on either what is happening to you or how you are responding, urging specific actions to remedy the cause of your sadness or offering much-needed reassurance. You might feel down if you have had recent setbacks or believe that you are not achieving your goals at a quick enough pace. Ease self-induced pressure by taking your focus off the future for a moment. Ponder the past to get a cheerful boost that moves you forward. Step outside of your comfort zone. Try something that you want to do but scares you because it's unfamiliar. You might deliver a presentation at a professional gathering, take a class in public speaking, participate in a community book discussion, or volunteer at an inner-city ministry. Facing a fear can energize you. Even if there are glitches, learn from your experiences and be glad that you are pursuing your dreams. The twittersphere inspired this approach to reclaiming hope — think about how you emerged from difficult circumstances in the past. Remember how you dealt with setbacks, sadness, and frustration. Putting these tactics into action can help you feel less dejected. Intense exercise, the kind that raises your heart rate and produces endorphins, can make you feel wonderful. I am amazed at how much a short but fast run eases anxiety, and even makes me oblivious to new difficulties that would otherwise cause anguish. Getting absorbed in a page turner is an excellent way to forget about yourself and your distress. You may not feel cheery at the very moment (think disturbing scenes from "The Kite Runner" or heart-tugging conversations in "Dear John"). But, most likely, you’ll distance yourself from your problems and feel better and happier about your life. Ask friends for book recommendations, focusing on the ones that deeply engage readers. Borrow from a friend, the library, or download a classic for free. Anticipating a fun trip — whether it's a day hike in the mountains or a weeklong trek to visit museums in Washington, DC — can make you happy. Although you don’t want to spend tons of your time simply planning an escape from daily life, creating plans to enjoy yourself can help increase your enthusiasm for the future. Lighthearted movies with an intriguing but not overly complicated plot can take your mind off difficulties, plus make you laugh. To keep this suggestion as a free option, catch a movie on television, watch via a streaming subscription (such as Netflix or Amazon Prime), check out a DVD from the library, or find a free screening. Ask friends about their favorite comedies or choose from a list, such as this compilation of the 25 best comedies streaming on Netflix that includes "Office Space." Children seem to possess an endless well of bliss, which they are nearly always ready to share. They can show you how to act spontaneously, make friends effortlessly, and, most importantly, live happily in the moment. Spend a couple of hours with your children at the local playground (if you have small children of your own); accompany friends with children on an outing; or offer to babysit for a harried parent to bring cheer to yourself and others. In my experience, some non-profit agencies are more adept than others at fulfilling their missions, serving their clients, and making their volunteers feel like a valued part of the team. So, if an assignment isn't everything you imagined, delight in the opportunity to meet new people and being brave enough to try something new. Watching a comedy show on television may seem like a frivolous waste of time, but if you need cheering up, it can be a great way to re-energize in 20-30 minutes. Although I often do productive tasks while watching TV, the best way to catch comedic nuances that make a show laughable is to give your full, relaxed attention. And, sometimes, you have to see several episodes (or watch the first season via Amazon Prime or Netflix) to understand the characters and plotlines. Similar to the approach for books and movies, ask friends for recommendations or check out entertainment industry lists. Figure out what is causing your listlessness. You may avoid trying to pinpoint a problem because you feel dissatisfied in all areas of your life. But this approach may reveal that there is just one thing that’s wrong and that it can be easily addressed. Teens can be a blast and impart hopefulness for the future. The ones I know (especially my sons and their friends) are insightful about the sometimes ridiculousness of accepted, grown-up behavior and can not only make you pause and think about your own pretensions, but more importantly, make you laugh at your own seriousness. Being kind can lift low spirits, letting you to realize that your ill feelings don't have to control you even when you are having a lousy day. Plus, you may learn that horrific things are occurring in other people’s lives; the recipient of kindness may tell you how your action helped them in a particularly black moment. For more than 100 ideas on random acts of kindness, check out this blog post from Anna Newell Jones. You can’t control the weather but you can get outside when the sun is shining. Spend 10-15 minutes outdoors on sunny (or even partly cloudy) days to lift your mood. Keeping up with friends on Facebook can be fun but may cause you to feel that you fall short in terms of a social life, cute-kid stories, and vacation travels. Step away from the computer in your leisure time and enjoy some real-world activities. Set aside a few hours each day not to worry, even if you have difficulty controlling fretfulness and anxiety. Free yourself to be happy by not letting worry dominate your thoughts. Dig out photo collections, either in hard-copy or digital form. Let memories of past adventures and fun times make you smile. Muster the energy to complete an unfinished project to restore peace of mind. Having lots of partially-finished projects may be weighing you down more than you realize. Choose one that involves mindless activity rather than complicated tasks. Not only will you momentarily forget about whatever’s bothering you, you'll get something done. Stroll through public spaces such as a city garden, beach, or a trail along a lake or river. Beautiful natural surroundings, along with movement, can lighten your mood. If you are short on time, hit the streets in your neighborhood or downtown area as a way of taking a brief break. Spending time with friends can help you to relax, enjoy yourself, and hopefully laugh and become cheerier. You'll celebrate friendships rather than focus on what you don’t have or what you haven’t accomplished yet. Pursue professional help if lack of cheer is an ongoing and debilitating problem, or if you have an issue that you can't resolve on your own. Your health insurance may cover mental health services. 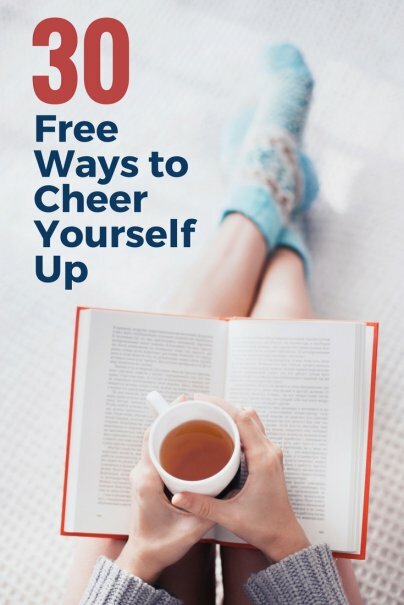 Alternatively, you may be able to locate free resources through your local mental health center (which may offer support groups) and counseling centers associated with your community, place of worship, school, or workplace. Whenever my sons, husband, and I play a board game, we always end up laughing breathlessly, either at silly responses elicited by personal questions embedded in the game or the raw competitiveness of each family member. Unlike many personal finance bloggers who consider board games a consistent source of cheap entertainment, I don't play very often. Still, this activity provides a pleasant distraction that can dispel the blahs. You are more likely to be cheerful if you sleep well. Take a nap or resolve to get to bed earlier or sleep later. If you are having trouble sleeping, get more exercise, consider resetting your sleep cycle, or cut out the electronic noise a few hours close to bedtime. 25. Learn From "The Happiness Project"
Stumbling blocks to happiness are often shared by others, even happiness expert Gretchen Rubin. You may find solace in seeing that you are not alone in your struggles. And, more to the point, you can discover tools for cultivating happiness and becoming more cheerful. Whether you made New Year’s resolutions, took stock of your values, set specific targets, or did none of the above at the start of the year, you likely have a dream that is yet to be realized. Put together a road map with the steps needed to achieve your desires. Through this process, notice your goals are well within reach, OR discover that getting there will be long and arduous. Either way, knowing that you have a plan can be encouraging. Gratitude can ease gloominess. Making a long list of things for which you are thankful can stir a deeper-than-usual awareness of what is going well in your life. The process of clearing out clutter isn't fun, but the results can make you cheerier. With clutter gone, you can more readily release angst associated with past events, find the items that you need in your house, and entertain friends more often. Quiet your discontent by applying your brainpower to learning a new concept or gaining a practical skill. Look for free classes in the community offered by the library, chamber of commerce, or recreation department; listen to free university lectures; ask a friend to share her expertise with you; pick up some programming skills at Code Academy, or take part in some of the free classes offered through Skillshare. Daily routines — working much of the day or night, fixing meals, volunteering at school, doing laundry, etc. — can be overwhelming. Give yourself a break by using vacation days to relax. If you can't take time off, cancel outside obligations for a few days or weeks while you recharge. You can be contented without being perpetually perky. But, if you'd like to feel and act more upbeat, make the effort to nurture authentic cheerfulness. What do you do to pick yourself up when you’re feeling down? LOVE these suggestions. You are so right by doing these they really do make you feel better. Glad these ways have worked for you!